Stress and tension can take a toll on you physically, but you can counter the effects with a massage. 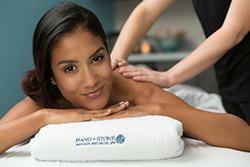 People across Olney, MD, have turned to Hand & Stone when they’re ready to relax and get pampered. We offer the services you'll want, and our rates are highly competitive. Rather than living with the tension, see how Hand & Stone can reverse the trend. We’ll treat you to a relaxing experience, and you can schedule an appointment for any day of the week. People throughout Olney have come to us for massage services, so give us a call today or just walk in to our salon.